This isn’t the first time Biden’s lobbied on behalf of the White House; he also wracked up minutes during the fiscal cliff debate to corral Senate Dems. It was only a matter of time before the federal government descended on Colorado as the debate over gun control waged on in the state House and Senate. Once again, President Obama is using Colorado as his personal proving grounds for passing his far-left agenda, and he’s sending out his minions to do his dirty work. But, Exum isn’t the only one receiving a call. Biden apparently has called Colorado Democrat State House Speaker Mark Ferrandino to encourage him to keep up the fight. The truth is that the four gun bills expected to pass tonight have been rammed through the Colorado State House just a week after their introduction because Colorado’s debate on gun control will impact the national debate. With several Democrats wavering in their support of this “crazy” (Dems words, not ours) agenda, Biden is here to ensure no Democrat strays. But, Biden isn’t the only minion that Obama sent to influence the debate in Colorado. Apparently, MSNBC‘s Rachel Maddow, who has a very special distaste for anything that resembles center or center-right, is planning to cover the debate on her show this evening. Let us be clear. This is a coordinated effort of which Coloradans should be aware. Perhaps as disturbing that the overall agenda, is the federal level’s aggressive interference in the state business of Colorado. The federal government has an outlet for passing its agenda, and it hasn’t. 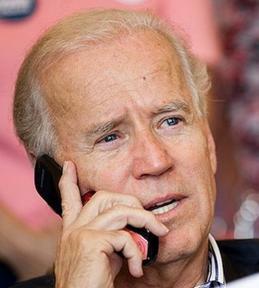 Perhaps Vice President Biden ought to focus on his area of operations and let Coloradans decide on ours. The Federal Government needs to stay out of state politics period. They are destroying the Constitution and now want screw up the State Constitution too? These people have revealed themselves to all for the tyrants they really are. amazing how short memories are.. the last gun control ban passed..Dems got creamed in the next election and took a long time to recover..I will support the efforts of any political opposition to the gun grabbers. Colorado is already a model for second amendment, trying to become California will be a big mistake socially and politically. What will Washington devise next, sticking their noses in places it doesn't belong. What will devise next, sticking their noses in places it doesn't belong. Gee, I hope that call from Crazy Joe sustains them after they're voted out next election.